Hey gang! It’s been fun doing the last couple seasons here. This will be the new thread for the upcoming year. Stay tuned. This past season was an eventful one. Filled with lots of ups and downs, and many changes. I accomplished some personal things that I wanted to, fell short on some, and learned a lot about what I want to do moving forward. The New Year brings a new season, a new lease on life, and a lot of unknowns. I’m excited to see how it plays out. Ok guys (and gals) this post is a little uncomfortable for me. I'm a very outgoing social person when it comes to just about everything, except my personal life. IMO, that's something that belongs at home, and not on social media; so I rarely post about my "interior" things online. With that being said I like to be honest and transparent to anyone who takes the time to read and follow anything that I do. This past couple years has been a bit of a challenge and about a year ago it become apparent that my marriage would not be sustainable. 2 months ago I signed papers and officially became divorced. This wasn't something that I thought would happen 24 years ago. Not something I thought would happen 4 years ago. Emotionally, Physically, and Fiscally it's been a hard transition. Right now it's new and with it comes a lot of changes. Many of them will be positive. I do apologize as my posting on the last Season was a bit sporadic over the last few months. Between home and hunting it got pretty hectic. I'm looking forward to getting back in the saddle here and getting this next year and Season on the road! I'm not looking for and don't need any posts of sympathy, etc. Definitely not the reason I'm posting this. I just closed on a new house about 10 days ago, 3 days before I flew out to Denver for a week for the ISE show. Still unpacking, organizing, and moving mounts! 2018 is going to spectacular. Hop on and enjoy the ride, I know I'm going to!!! Way to keep a positive outlook, Les. I’ve enjoyed following your hunting adventures over the last couple years, I can’t wait for Another Season. It's application season, who's started? I have got my Wyoming app in, and meeting with a couple of buddies on Saturday to talk hunting and start putting the rest of the plans in motion. I'll likely be hitting the NM lottery again. I've got plans for a couple other hunts for deer and Hunter and I will be headed to Ontario this spring on a bear hunt/walleye trip. Who else is going where? Im getting ready to put in my first Wyoming Elk application. Me, my father in law, and a couple buddies are also going to do an OTC DIY archery elk hunt this fall. Finally decided to quit putting it off and just go get our feet wet. Our party put our WY elk app in yesterday. We're planning on getting a cow tag in he special draw as second choice to hunt the unit we are interested in using our points in next year. If we strike out in WY then we'll get a general tag in MT for elk. Likely going to Iowa on a WT hunt early November. Currently holding a OTC Barbary sheep Tag good till the end of March. Went out Saturday. Nothing but turkeys and cattle. Gave the new Tac frame and Argali a work out. Whats the deadline on WY? I believe we will be putting in for general deer, I need to get an elk point spaced it last year. This year will be my first year elk hunting in over 20 years and looking forward to it. I'll be putting my app in for WY elk, but will be looking at MT if I don't draw, then CO if I have to go OTC. 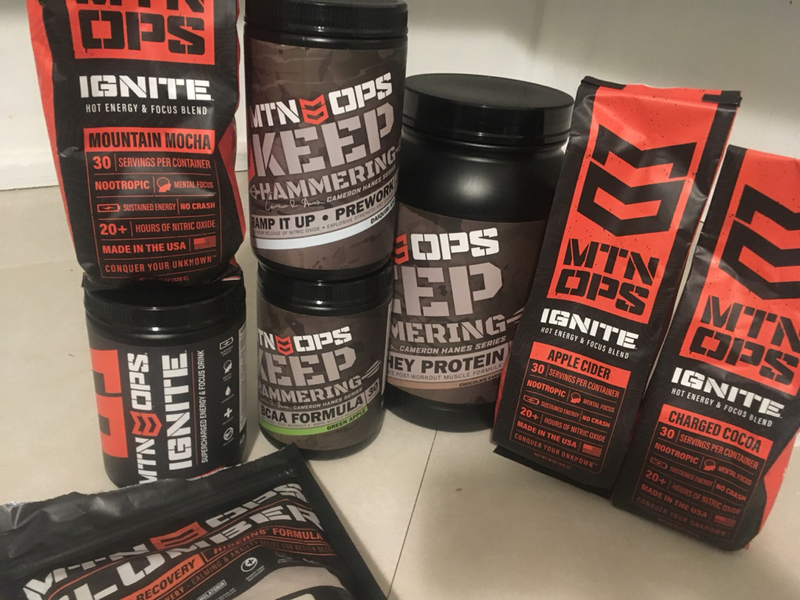 As an FYI there are some new MTN OPS products getting ready to drop. I’ll be able to get you the low down on my testing of them and what they are shortly. IronWill Outfitters made the trek to ATA down in Indy. 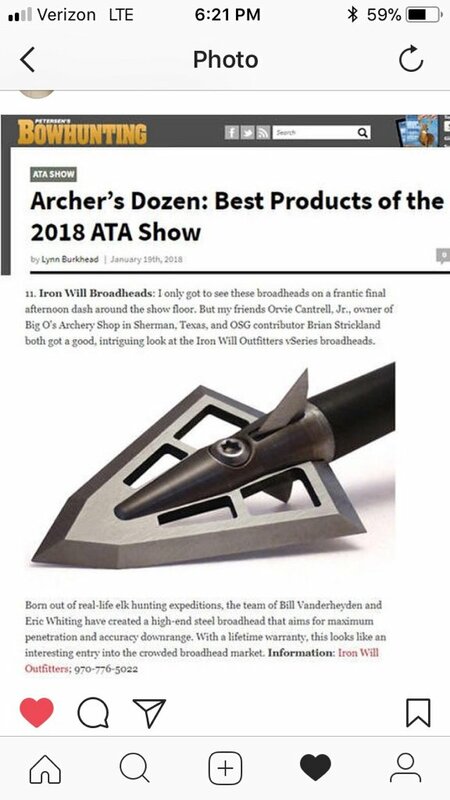 Petersen’s Bowhunting has them listed as one of the top new products in 2018 at ATA. I will be honest. I tried these out last year and didn't see what people were talking about. They were OK at best but were like a whistling pig when flying. Not a huge deal but for the price I just didn't see it. With that said, the new solid design looks awesome and I might give it try again. If you were like me last year, I wouldn't count them out. The new design looks great. That a boy. Great to see you at ISE and hopefully in the woods soon buddy. Thanks for the feedback Joe. What head did you try last year? Got some new stuff in, and some more stuff coming to test. Stay tuned, when I can drop the product names and flavors I will. This the last 2 morning’s has been ahhmazing. Great flavor and the pick me up is fantastic. I don’t like coffee so this rocks! Looking forward to tagging along again. I enjoy the hunts, Good luck with everything Les.